You join this universe in the earliest days of mankind’s ambitious invasion to retake the central planets from the Scourge. Bloody battles and epic conflict awaits as races, generals and individuals take sides. Whether you’re fighting for humanity, the Scourge or for your own ends is up to you! Dropzone Commander (DzC) is a 10mm scale sci-fi tabletop wargame, devised for mass battles between two or more players. The rules are designed for efficient and dynamic games which can be played on a standard 4’x4′ table (although larger tables work well also!). The rules are based on an alternate activation system, which keeps the action constant and involving. They are also scalable, and will cater for tactical skirmishes as well as titanic clashes of metal and firepower. This is accomplished whilst never sacrificing the character of individual units, and indeed all the colour and eventfulness of battle. A vast array of war machines will be at your disposal, but this does not belittle the importance of the humble infantryman. The game is built around the concept of rapid deployment and redeployment of your forces by airborne dropships, exemplifying the pace of combat on the battlefields of the future. This makes for a tactical and fast paced experience, where quick thinking and strokes of genius often bring victory. In Relics, players control forces comprising of several units as diverse as black powder musket wielding dolls to clockwork powered fighting machines to battle for the fate of the world and see their faction to victory. Forces of magic saturated elemental creatures battle against creatures of teeth and claw. Using a fast paced core mechanic, the game delivers furious action on the table top. Players must use their tactical genius to out manoeuvre their opponent before delivering the killer blow. Relics is a miniatures table top wargame in the 28mm scale range. Gruntz 15mm is a ruleset for SCI-FI skirmish wargamming. It was designed from the ground up to be specific to scales and ranges in 15mm and is focused on integrating a fun combined arms game where you can combine tanks, mecha, squads and specialist ground and air support units. 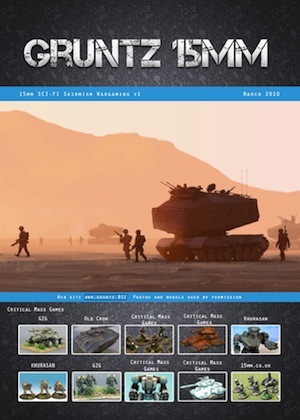 Gruntz won the Tabletop Gaming News readers vote for best new rules in 2011 and there are some excellent reviews on the Wargames Vault where you can buy the product. An Excel builder spreadsheet which is work in progress. The spreadsheet still requires some finishing touches and adjustments and is “open to development”, so if you spot anything you can improve or help please let me know. Originally released in February 2011 (updated and expanded in April 2012), these fast play Renaissance rules recreate the smaller actions so common at the fringes of the European world. There are army lists for Britain, Ireland, the major European colonial powers, and the peoples of the New World, the East Indies and the Eurasian steppe. Designed for engagements between c. 1519 to 1641 with forces 500 – 2,500 strong the emphasis is on the tactical concerns of command, company resolve, weather & disease. 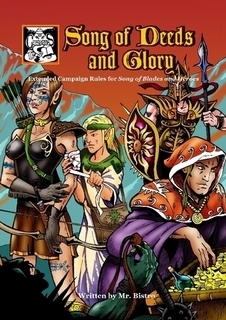 Song of Blades and Heroes is an exciting set of fast play fantasy rules that can be played with your existing miniatures. CONVENIENT: a 2’x 2’ play area is enough. Bring all your armies in a shoebox! 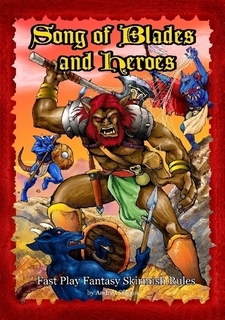 READY TO PLAY: 180+ monsters and heroes included, and you can create your own! Epicwargaming.com is the Home of FREE Print and Play Wargaming. So on Epicwagaming.com you can expect to find all you need to wargame with, such as: free downloadable figures to game with, good comprehensive rules and downloadable print and pay terrain or scenery. However, you will have to provide your own wargaming table and dice, as they can’t be downloaded =O). Three Plains is a Great Conpeling Battle Strategy Turn Base Game, which simulates a Pitched Battle, where two (Plus) Players go head to head with their own ‘Armies’. The armies consist of small figures, which you can layout as you wish, creating your own unique style of play. The scales of the models is 15mm. The game should be played on a Tabletop 4X6 Foot, but any open space of a similar size will do. Also you will require six sided dice or D6s to play with game. It’s amazing but true; all other wargames do not have a system for stamina. In Three Plains, you suddenly discover the magic of having FRESH TROOPS, (you’ve cunningly had held up in reserve) hitting hard, but knackered enemy troops and wiping them off the board! You just don’t see that in other wargames. Three Plains has its own psychology phase, called the ‘Battle Stress’, which raps up all the battle stress a gaming piece might encounter during it’s turn. So rather than taking test after test, only one needs to be taken at the end of the turn. Instead of the Magic having it own phase, you can cast magic anytime you wish, which really speeds up game play and helps the more forgetful gamer. In my opinion, fantasy wargaming tends to be a little Character heavy. Sometimes it seems the only reason why troops turn up to the battle is to get a good kicking from an overpowered Character. Well not in Three Plains. For instance, because of the ‘March Over’ rule, Characters in combat with a unit are simply marched over and killed outright. Well, why should a strange bearded man (wizard) with one or two crummy attacks pin down an entire unit numbering hundreds? Would you stop, I think not.